The DJ on the radio had an interesting topic today about people's obsessions with text messaging. Now this is a Top 40 station, with the listener demographic running from early teen to middle-age. A lot of callers chimed in with stories about their kids text messaging each other while in the SAME room, or while AT the Christmas dinner table. Then one adolecent called in to defend texting by saying "it taught kids to read!" The DJ quickly put the girl in her place by asking her to read her last two messages. "Hey" (Wow, now that WAS important). "What are you doing later?" (Another earth-shattering emergency message). Then he asked her if "You" was spelled "U". Um, yeah, she sheepishly admitted it was. "And was "Are" spelled "R"?" he further queried? Of course it was! "I said it taught kids to READ, not SPELL." But the best one was the fellow who phoned in to say while on a date, his female friend actually said "LOL" to his face. That was the end of the date for him. I had to shake my head at how lazy people are becoming... using acronyms instead of attempting to speak properly to each other in real life. ... until I remembered what I did today while taking the dog out the back door for her morning constitutional. Yeah, they sure won't understand that. I mean, really. They don't even HAVE thumbs to text message. Sorry, just HAD to do it! Couldn't resist! Nope, the temptation was just too strong! I so agree with you on this subject! (And your cat photo was PRICELESS!) I really get frustrated when my younger friends use the lazy way to type things in messages to me. I will admit to using some of the acronyms when using an instant messenger, but never anything else. (Except up at the top of this message, but that was a special case!) As for texting, I'm not a big fan, but sometimes it does have its uses. I've NEVER used an texting acronym in speech though! That was TOO funny! Thanks for the chuckles! Cats have telepathy....they don't need 'devices' like us humans. Who is the smarter creature? This is one of my biggest pet peeves! Not texting, but when people use text slang in everyday conversation. The other day I said, "Oh Mmm Gee!" I almost smacked myself! Awful, I know. Auntie Maureen, if I have learned *anything* from the internets, it's that Cats ONLY use broken English dripping with grammatical mistakes and text slang! I can has retracshun of statement kthxbye? Who am I kidding, don't listen to me considering that I live in a bubble specially designed to house nerds, a so-called "nerd reservation". I'll leave it to the rest of you to determine what's cool, ha! Phoenix5: LOL!! See, you can do it here; that's acceptable... but if we ever meet face to face, you must actually, Laugh Out Loud. Thank you. Ashley: Har! (I mean, LOL!) Yeah, one of my favorite sites is LOL Cats... I should have remembered that. What amazes me is all the effort it takes to text when you can just as easily speak and/or leave voice messages. I don't get it. "Nerd Reservation"... I'll have to remember that one... and tease you about it the next time you're back here! Hee hee, you are like the living embodiment of those text messaging commercials. Like the one with the two girls and the granny all talking in code while playing Scrabble with their mom. Those crack me up all the time! That's great, Maureen. Thankfully I have not gotten as bad as that, but yours did make for a funny moment. Your cats do look very puzzled on the photograph. As much as I love technology and the ilk, I hate the texting craze. Hate it. It's just another ploy by Verizon to take over the world. OMG! UR CATZ LUK LIK MINE! HOW LOL IS THAT? DO THEY LIK CHEEZEBURGERS 2? One Siamese(looking)white and grey cat. Love it!! :-) Thx for the grin today, Maureen! Funny, funny, funny, Maureen!!! Love the kitty pic, too. Their expressions are perfect for their thoughts. Hilarious! Haha! I'm guilty, too. 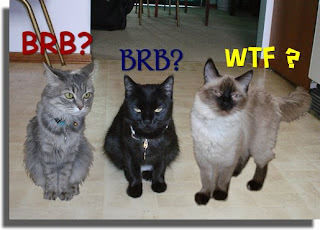 I've said BRB. I've also said WTF, especially when the babies are within ear shot. 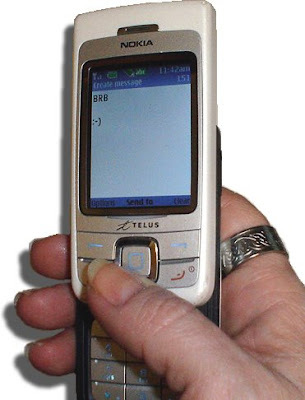 That said, I despise texting and it's from my MSN chatting days. The language really does stick with you. that was too funny and I love the cats! Ha! As much as we despise it it seems that we all fall victim to the "teen speak". I blame it on my 15 & 13 yr old stepdaughters. omg this is toooooooo funny...thanks for the giggles. Funny...and sad. My theory is that in 50 to 100 years there will be no languages; just a hybrid of acronyms and slang used globally. VP: I know the one you mean! I thought about that after I wrote the post! Casdok: Don’t you mean LOL?? CGG: Har! Verizon, and all the other cell providers. Peggy Sez: OMG too! You have the same trio? Cool! JP: Yer welcome! ‘Bout time I reciprocated! Huckdoll: Yeah, around kids you have to watch what you say. Before you know it, they’ll be regurgitating all your not-so-favorite sayings! Worker Mommy: Yeah, those teens will do it to ya ever’ single time. Jill: I wonder what they’d text back, though? Lunanik: I’ll take a stab: TISFU: That Is So Funny You? Some text messages from my daughters have been almost undecipherable due to this! So. First of all, 'lol' 'lmfao' and 'rotfl' are not always used to literally mean what they stand for. 'lol' and 'lmfao' are really just there to acknowledge something funny. it does not mean we laughed out loud. It's common textiquette, really. If someone cracks a joke, you have to acknowledge it SOMEHOW. Also, i personally use perfectly normal english while texting (although, i admit, my letters may not be capitalized where they ought to be) my friends use proper spellings when they text me.. though that might be because they know i'll flip my lid if they say "omg 2fny hey btw ru f2nt?" and, unlike most of you adults, i have never used 'lol' or 'brb' in actual conversation. ahhh the thought is painful. the only text-speak i ever use while speaking is "FML" which is because if i said the real words, i might get in trouble. and finally, the reason we text? it's much more surreptitious, and the adults can't hear it. i have, on many occasions, texted my older sister while we're both trapped in the backseat of the car. why, you may ask? because we don't want mom and dad to hear. we also text under the table (though not generally each other), which is totally unnoticed, as we can text without looking at the phone. THE BEST WEBSITE!! K, not really. but oh well. Thank you for the help Annika! And yes, it is only fair to hear the other side... I wish I had some way of speaking to my peers when the adults were in the room. We only had pig-latin, and that didn't work. And you got me on all those new acronyms; I guess I need to really visit that site! Ha!